Bouvier, Raphaël. Jeff Koons - Der Künstler als Täufer. Germany: Wilhelm Fink Verlag, München, 2012, p. 274 (pl. 53), illustrated. "Jeff Koons Desire of Love." Monthly Joong-ang August 2011, p. 337, illustrated in color. Shaw, Amy. “Jeff Koons: The Pain of Inflation.” The Art Newspaper, Art Basel Daily Edition 16 June 2011, illustrated in color. Douaire, Pierre-Evariste. “Koons Est Gonflle.” Clark Magazine (no. 45) November/December 2010, illustrated in color (with the artist). Bartl, Alexander. "Geniale Spatzunder." Elle [Germany] April 2010, p. 136, illustrated in color (in background). Freund, Anthony Barzilay. 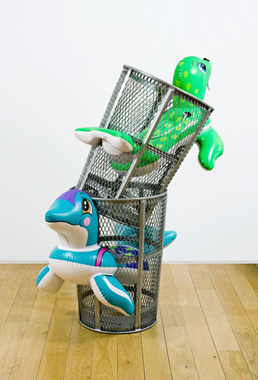 "Made in Chelsea: A Conversation with Jeff Koons." Sotheby's At Auction 9-26 November 2009, p. 9, illustrated in color (in progress). Welham, Jamie. "Playing with Popeye - and his inflatable friends." West End Extra 3 July 2009, illustrated in color. Jones, Jonathan. "Not Just the King of Kitsch." The Guardian [London] 30 June 2009, p. 9, illustrated in color.